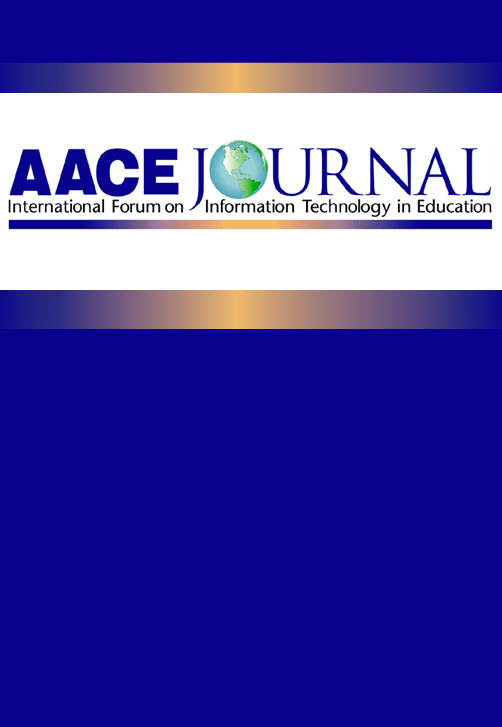 This article considers the research literature of the past decade pertaining to the use of computers in early childhood education. It notes that there have been considerable changes in all aspects of our lives over this time period and considers studies in which information and communication technologies (ICT)and in particular, computers, have been studied in early childhood contexts. Yelland, N. (2005). The Future Is Now: A Review of the Literature on the Use of Computers in Early Childhood Education (1994 - 2004). AACE Journal, 13 (3), 201-232. Norfolk, VA: Association for the Advancement of Computing in Education (AACE). Retrieved April 26, 2019 from https://www.learntechlib.org/primary/p/6038/. Association for Childhood Education International (2003). Special Edition. Global perspectives of educational technology. In S. Swaminathan& N.J. Yelland (Eds.) ,Childhood Education, 79(5). Australian Council for Educational Research (1990). Being numerate: What counts? Victoria, Australia: ACER. Banger t-Drowns , R. (1993). The word processor as an instructional tool: A me ta-ana lys is of word processing in writing instruction. Review of Educational Research, 63 , 63-93. Brooker, E. (2002). Starting school: Young children learning cultures. Buckingham: Open University Press. Casey, J. (1999). Hope of the new century: Early literacy, the empowerment of technology. Sixty third Yearbook of the C laremon t Reading Conference (pp. 117-124). Dede , C . (2000) Commentary: Looking to the Future . The Fu ture of Children , 10(2) , 178-180 . Education Queensland (1999). The next decade: A discussion about the future of Queensland state schools. Brisbane, Q ld: Education Queensland. Kaiser Family Foundation (1999). Kids and media and the new millennium. Mathematical Sciences Education Board (1995). Mathematical preparation of the technical workforce. Washington, DC: National Research Council. National Council of Teachers of Mathematics (NCTM) (1998). Principles and standards for school mathematics: Discussion draft. Reston , VA: NCTM. National Council of Teachers of Mathematics (NCTM) (2000). Principles and standards for school mathematics. Reston , VA: NCTM. Papert, S. (1996). The connected family: Bridging the digital generation gap. Atlanta , GA: Longstreet Press. Resnick, M. (2000). Commentary: Looking to the future. The Future of Children, 10(2) , 173-175. Robinson, L. (2003). Technology as a scaffold for emergent Literacy: Interactive storybooks for toddlers. Young Children, 58(6) , 42-48. Smith , C . (2002) . Click on me! An example of how a toddler used technology in play . Journal of Early Childhood Literacy , 2(1) , 5-20 .